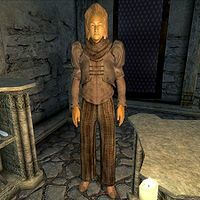 Earil is an Altmer enchanter living in Crucible, New Sheoth. He is the owner and proprietor of Earil's Mysteries, the only spell shop in the Shivering Isles. At high levels of Mercantile skill (50+), his store may be a good source of rare rings and amulets, such as the Mundane Ring or Necklace of Swords. He is manically obsessed with time, the consequences of time passing, and the fact that everybody is going to die at some point, no matter what. This obsession has lead him to study Chronomancy, the magic of time alteration but, with the exception of his intense dislike towards local kleptomaniac Brithaur, he lives a rather isolated and normal existence and never even leaves his store. He sleeps in the private area above the main trading room every night between midnight and 8am. After waking up, he unlocks the door and spends the next ten hours offering his services to the occasional customer. He closes the shop at 6pm, eats a two-hour dinner on the second floor and then just wanders around until his bedtime at midnight. Earil wears coarse linens, a patchwork shirt, and a pair of scruffy shoes. He carries a key to his store. Earil knows and sells spells from the Conjuration, Destruction, and Restoration schools of magic. When you approach him for the first time, it becomes apparent that his intense studies of time alteration may have had some negative impact on his sanity: "Firm arms. A strong back. Yes. You'd do nicely. It's a shame. Time will ravage you, destroy you. Whither [sic] you. But there are... alternatives. Time need not slow you. Tell me, have you ever considered placing yourself on display?" When you ask him to elaborate he will say: "Oh, yes. You see, I am a student of chronomancy -- the magic of time alteration. Using magicka, I will slow your heart rate, your breathing, your movement, and your thoughts until they may as well not be functioning at all. You will be perfectly preserved. Taken out of time. Beautiful forever. I will display you with the rest in my collection." When you decline his offer he will simply say: "Oh. What a pity. Well, then. What is it that I can do for you? And be quick about it. Every second that passes brings us closer to our graves." He will end the conversation with a strange statement: "Please, come back soon. No telling what oddities I may have for you next time." If you approach him again he will greet you with: "Well? What is it you need. Please, be quick about it... the seconds are ticking by as we speak. Ohhhh. There goes several more." You will occasionally hear rumors of Earil's hatred of Brithaur: "Earil has a big problem with Brithaur. I don't know exactly what the problem is, but it's safe to say Earil is making a huge fuss over it. Earil owns a magic shop in town called Earil's Mysteries. If you want to know more, I'd suggest you ask him yourself. ", "I hear that Earil is fed up with Brithaur's antics. He really wants something done about it." and "Indeed. I'm surprised Earil hasn't taken matters into his own hands." If you follow up on these rumors and ask Earil about Brithaur he will go off on an angry tangent: "That lout? Yes, he's a thorn in my side that never seems to go away! I'd have his heart on a plate if I could! I wish he'd simply disappear from the streets of New Sheoth forever! Oh look, just talking about it has given me another gray hair!" Asking him what caused him to loathe Brithaur so much will have him explain Brithaur's less than legal hobby, and Brithaur's lack of aptitude in that hobby; "For one thing, he's a thief, but what irks me the most is that he's a BAD thief. Between my shop and a few others in Crucible, he's been caught stealing maybe a dozen times last month. Who has time for this sort of thing? I mean, at this rate, I'll grow old and die before he's out of our hair! I'll tell you what I tell anyone else who asks. Get rid of him for me and I'll make it worth your while. Do hurry... time's wasting!" Asking him about Brithaur again before dealing with the problem will have him remind you to take care of this task: "Prove to me he's gone, and the reward is as good as yours. Now please, get a move on... I feel my bones getting more brittle as we speak." Speaking to him again will have him ask if you took care of Brithaur yet: "Have you dealt with Brithaur? I'm not getting any younger here waiting for you. You must hurry and get rid of him!" Speaking to Earil again, after having helped Brithaur gathering the last of the items he needed to complete his collection, will have Earil thank you for helping him, and rewarding you with a leveled amount of gold: "What? He's promised not to come around here anymore? Fantastic! Took you long enough though... I don't know how you did it, but I appreciate it. And by appreciate, I mean reward. Enjoy." If you took care of Brithaur in any other way Earil will be more suspicious of your claim; "So, you've dealt with the problem, eh? I like the sound of that. How do I know he won't come back?" 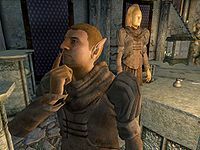 If you ask Earil to trust your claim that Brithaur has been dealt with he will accept your claim, and give you gold as a reward: "Hmmmm. Very well. I don't take you for a liar. Here is your reward, as promised. Now, if you'll excuse me, I must get back to things. Shoo! Scoot!" If you offer Earil Brithaur's heart as proof of the deed he will be pleased that Brithaur has been dealt with, and will give you more gold than you would have received if you dealt with him in any other way: "Very nice. In fact, I may be able to make use of this particular item. Seems like a nice potential replacement. You've more than earned your reward. I believe a bit of a bonus is in order. Well done." "If spells and magic are what you seek, head to Earil's Mysteries and take a peek." "If its spells you seek, this place supplies, use Earil's for all your magic buys." "Of the bumbling thief by the name of Brithaur of this I can only say. The man named Earil who owns a shop wishes he would go away." "I've heard that there are new adventurers coming. I wonder what new discoveries they will bring to us." "It's a shame, really. The Gatekeeper was a beautiful specimen. Now he'll just rot and fade like everything else." "The Resonator of Judgment is fixed! How horrid! New adventurers mean new exhibits!" "This Chalice of Reversal sounds like a horrid device. Who would want to spend their time under the effects of some... chemical?" "All this talk of torture has me thinking -- would it be possible to hold someone in time during their most painful moment?" "So, the Torch is lit. Can a flame be captured in time? Would it still burn?" "A new ruler of Dementia. Excellent. If I could only freeze this moment in time." "Thadon has been replaced. It is a moment worth capturing forever." "They say that invaders have come to the Shivering Isles. Of course, "they" say a lot of things, don't they?" "That flesh monstrosity that patrols the Fringe has been rebuilt. Better to let it stay dead if you ask me." "If the newly restored armies need conscripts, I could be persuaded to enlist a few of my exhibits." "The Madgod has vanished? Perhaps He simply stepped out of our time until the Greymarch passes." "The Greymarch is over, the war has been won, but at what cost? This timeline will never be the same." If he dies, Earil's body will be taken to the New Sheoth Graveyard with a tombstone bearing the inscription, "He taught us to make the seconds count before we close our eyes". This page was last modified on 17 June 2018, at 10:56.